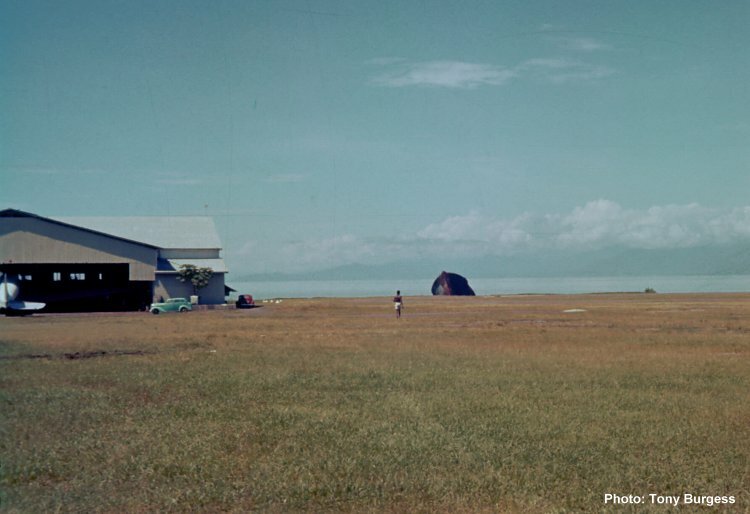 The wreck of the Tenyo Maru looms up at the end of the strip at Lae in 1962. The Tenyo Maru was a luxury passenger liner which was pressed into service as a mine layer during WW2. The vessel was sunk off Lae on 10 March 1942 by US Navy Dauntless dive bombers. In the seventies, the bow of the ship slipped below the surface during an earthquake thus depriving PNG aviators of a useful landmark. The hangar on the left was occupied by Mandated Air Lines.